Now back in the Netherlands, and with all my fotos uploaded to my laptop, I can now begin my Jordan travel diaries. You might have noticed [grin] that I love chronicling my travels and this is mainly because the act of writing what I have experienced is akin to re-experiencing the experience. Like déjà vu. Besides, it somehow seals the whole experience for years to come, for me to come back to and live through them again. This is hoping that Google, the owner of Blogger and Youtube, and Multiply (this did and I have to re-upload the pictures to my Google storage) as well will not go into administration and I can turn back the clock and look at my blog entries and fotos with a smile and a hint of familiarity—oh yeah, I have done that, I was there. So I will start with our arrival in Amman. We landed just before 18:00 in Queen Alia International Airport. Dutch nationals are not required to have a pre-entry visa but Jordanian immigration authorities requires a visa for most foreign nationals entering which can be bought without hassles at the port of entry. We went straight to the visa section to buy our visas which is 10 JOD (1 JOD is 0.95 EUR). There is a money exchange kiosk and I believe an ATM just before the visa booth, so that is handy if you do not have Jordanian Dinars because they do not accept any other currency nor credit card payments. Stunning tail, the crown logo makes everything for that grandeur royal look. Plane views just before landing. I am quite loyal to KLM but there are instances when I have to fly a different airline out of convenience. KLM does not have a direct flight from Amsterdam to Amman. Royal Jordanian airline is the only airline that flies direct. Their planes look very pretty from the outside although I can tell they are a bit old already. Food was nothing to rave about. I must say that service was SUPERB. Lovely RJ cabin personnel. 18:15 and we are in the taxi to the direction of Amman. The drive to the capital is going to be about half an hour. Cabbie driving skills was OK, nothing near a rollercoaster ride. The taxi drive from Queen Alia International Airport to Amman Centre -- about half an hour, costs 19 JOD. We arrived at our hotel—Hisham Hotel, a local Arabic owned hotel located at the back of the French Embassy in the 3rd circle. We arrived just before sunset so we had a good look at the surroundings. Military security personnel in the posh neighbourhood of our hotel. However, I think our location is the safest part of Amman, what with all these severe security patrolling and guarding the area. Our hotel room was quite big, with wide floor to ceiling mirrors (we love this of course), with free internet, and it even has a Louis Vuitton trash can in the toilet, haha. Beside Hisham Hotel is the oldest bar, they say, in Amman. We checked it out quickly (forgot to take a foto) before retiring to bed early. The view from our balcony: Amman. Anyway, after checking in to our hotel, we asked the hotel manager if he has recommendations for a great restaurant. We want the best traditional Jordanian restaurant in town for dinner that night. He called up his first choice (forgot the name of the restaurant) but it was fully booked. Argh, happens all the time with the best restaurant huh. He gave us another alternative but we decided to just do our own thing and went to Al Rainbow Street in the 1st circle instead to see what night life in Jordan, a Muslim country, is like. The taxi (rate is 1.5 JOD to 2 JOD max within Amman, do not pay more!) brought us to Al Rainbow Street in 5 minutes and we walked the whole stretch filled with commercial shops, Arabic fast foods and café restaurants offering non-alcoholic drinks and the famous hubbly bubbly—Shisha or Hookah or in plain English, waterpipe. Some restaurants do offer beer so for those who cannot disentangle night life and alcohol there is light at the end of the tunnel here. Wandering along Al Rainbow Street we came across this Arabic fast food place making Falafels (fried chickpea balls). They are good but not really my favourite. I guess this is the best place to go in the evening if one has to experience the local Amman, Jordan night life otherwise popular venues with similar or much better offerings would be the modern international hotels but it won’t be quite near to going local. We had dinner in Old Times Restaurant and then people watched for the rest of the evening really. When we had our fill of the Tahini Kufta and had coffee, we took a cab back to the hotel and pretty much tucked ourselves in early to get ready for our next adventure day in Amman. Managed to take 2 fotos last night in Oudegracht and by the Dom Tower grounds. As for the Dutch Royal family, they are visiting Thorn and Weert in the south of the Netherlands. They always visit 2 towns every year during Queens Day, see foto slideshow from NU.nl website here: Dutch Royal Family during Queens Day 2011. I am not a royal fan (the William and Kate royal wedding madness yesterday I thought was silly and over the top) although I see them as an integral part of Dutch culture and soceity, however, since we are not anymore in the Middle Ages, I believe these mega rich royals need to start paying tax. We cannot be forever subsidizing their lavish and sometimes frivolous lifestyles just because they were born noble. Next post will be my Jordan travel diaries! Precisely 2 years ago me and Blondine were sitting on this same café restaurant on Djemma el-Fna. The Café Restaurant Argana is probably the most popular traditional café restaurant on the square because it has a nice balcony with a view down to the Djemma el-Fna square. Blondine and I had lunch here twice and I have a few fotos below to remember the events. It is scary to think that major tourist spots are not safe anymore these days. This is not confirmed yet but police are suspecting a suicide bomber or someone who left a bomb in a bag in the restaurant and left just seconds before it detonated. Moi here 2 years ago (04-2009) with cafe restaurant Argana at my back. First lunch we had in the cafe restaurant on the balcony. Our view down to Djemma el-Fna square. Our second lunch and tea in the cafe restaurant. Yummy salads. Marhaba everyone! Now its time for us to relax a bit and pamper ourselves at the Dead Sea... het is hier heerlijk. Maá as-salaamah. Laters. Tot zo! Hi! I have been busy travelling around Jordan. Here are some postcards I am leaving for the blog, hopefully this will encourage those with itchy feet to plan a trip to this beautiful country. More stories and fotos when I am back. Soon. Magnificent Petra, the Nabatean Rose-Red City in Wadi Mousa. This is 'The Treasury' on the foto, all carved out from a boulder by hand. Driving on the desert highway. Jordan is bordered by Iraq to the east and Saudi Arabia to the east and south (Israel to the west and Syria to the north). It sounds a bit surreal to know Iraq is just a few hours drive and Syria up north is currently going through major clashes. Here in Jordan, everything is peaceful and the locals are wonderful. Amsterdam to Amman is about 5 hours. Flight was uneventful and I was able to sleep for an hour. The Royal Jordanian airplane was half full, obviously due to the Middle East situation very few tourists are travelling to this part of the globe. Lekker rustig. Royal Jordanian has the only direct flight from Amsterdam to Amman. KLM flies via Paris and we would have arrived past 11PM if we chose this option. After checking in to our hotel, we went to Al Rainbow Street (a local hangout area with many coffee and tea shops) located in 1st Circle, Amman and we had dinner in a restaurant that has a bar and outdoor cafe terrace called -- Old Times Restaurant. The view from our table is the terrace and the busy Al Rainbow Street. We ordered Tahini Kufta, a typical Arabic (Jordanian) lamb meal with potatoes and while enjoying our first meal in Jordan we did some people watching as well. It was so tempting to do the hubbly bubbly but we'll wait for another night perhaps. The restaurant seems to be a popular and chic place to hangout? Hi, I am off to Jordan in the Middle East and I am quite excited about this trip but I must admit I did feel a little bit apprehensive of the current unstable situation of the region. I booked this trip last December, before the uprising in Tunisia and Egypt and ever since I have been hooked to BBC World News everyday following the Middle East status quo. So far nothing on the news has convinced me to pull back. From what I understand, Jordan is a secular, modern and advanced Arab nation. The King with the lovely wife is the boss, like Bahrain, it is a constitutional monarchy country. So far the protests were quite peaceful except for the clashes that happened in Amman last Friday but this is minor in comparison to its neighbours. According to the Global Competitiveness Report, Jordan ranked 1st in the region in terms of police services reliability and 14th in the world. For prevention against organized crime, Jordan ranked 1st again in the region and 9th in the world. Quite impressive! So yes, apart from the recent clash I did my research and do feel safe about this trip. There are a few ways to get to Sausalito from San Francisco and the two easiest ways are by car and by boat. I have no experience with the boat, although I would love to—they can be boarded in Pier 39 and Embarcadero. By car the drive is about 10-15 minutes from San Francisco via the Golden Gate Bridge. Funnily, because we arrived at the other part of Sausalito town where it’s a bit quiet, Dutchman started jeering, taunting me albeit jokingly—‘Now, show me... where is this Sausalito hype...?’ We drove around a bit and decided to park the car to explore further on foot. After walking past the harbour filled with yachts and down to the main street where many shops are located, we saw a beautiful coastal promenade with spectacular views of San Francisco, and this was when we realized—aaah, this is the hype people have been talking about. March is obviously not high season and there were very few people there but I can only imagine how the place would look like in the summer, or even in spring. The harbour and the dramatic shoreline lined with shops, restaurants and a sidewalk promenade, the wooded hillside peppered with houses and the impressive panorama of San Francisco makes the little town of Sausalito a beautiful place to visit and experience. Great for a half to one day side trip. My souvenir photo of course here in the marina of Sausalito. 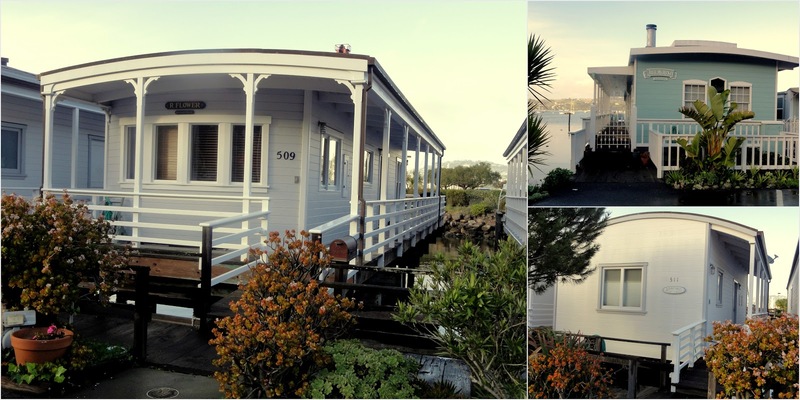 Charming little wooden boat houses (this is only one of them) along the harbour. Yacht masts and lockers for the yacht owners in the harbour. Love these lavender-coloured flowers dotting the shoreline. View of San Francisco from Sausalito harbour. Sausalito reminds me of Italian coastal villages, American version of course. More on Sausalito in next entry. Welcome to my life, to my world! I am in my late-40’s, child-free and I have a career in sales & business development in the technology sector. I work full-time and travel and experience the world part-time. This travel and lifestyle diary reflects my passions in life and experiences—the places I have travelled to, culinaire that I have discovered, my love for art and architecture, my quest in understanding our cultures and my desire to learn the history of our world. When I am not travelling outside the country, I am sometimes trailing the local lifestyle scene and playing the quintessential tourist. I also love taking random pictures of everything. Why am I blogging all these? Well, I love sharing my finds and re-living them as well on this blog. And when I am old and cannot do much, I hope to look back in here, and smile and say—Ah, I have indeed lived. Come in. I hope you enjoy your stay. Visit Travel & Lifestyle's profile on Pinterest.